In this lesson, we will learn how to calculate the area of a composite two-dimensional figure consisting of two or more shapes. 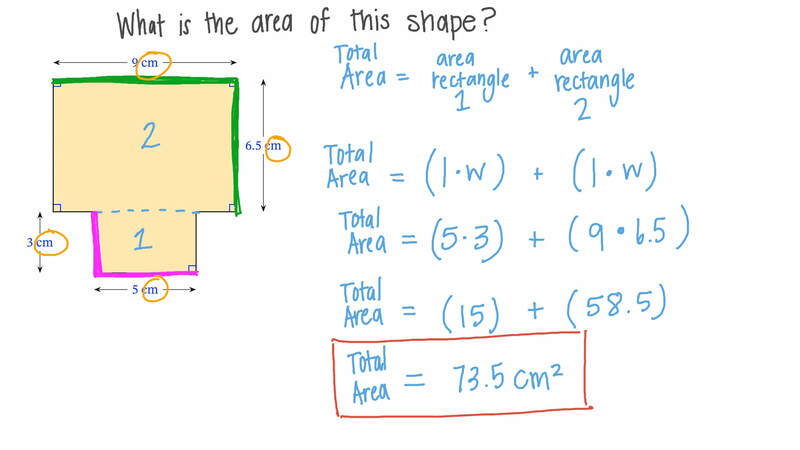 What is the area of this shape? Determine the area of the given figure. Using 3.14 as an estimate for 𝜋 , calculate the area of the given figure. Find the area of the shaded part using 3.14 as an approximation for 𝜋 . Given that 𝐴 𝐵 𝐶 𝐷 and 𝑋 𝐵 𝐶 𝑌 are two parallelograms, and the area of △ 𝑋 𝐶 𝑌 = 1 6 . 8 1 c m 2 , find the area of 𝐴 𝐵 𝐶 𝐷 . The diagram shows a parallelogram 𝐴 𝐵 𝐶 𝐷 with 𝐴 𝐵 = 6 . 4 1 and 𝐸 𝐹 = 3 . 8 2 . 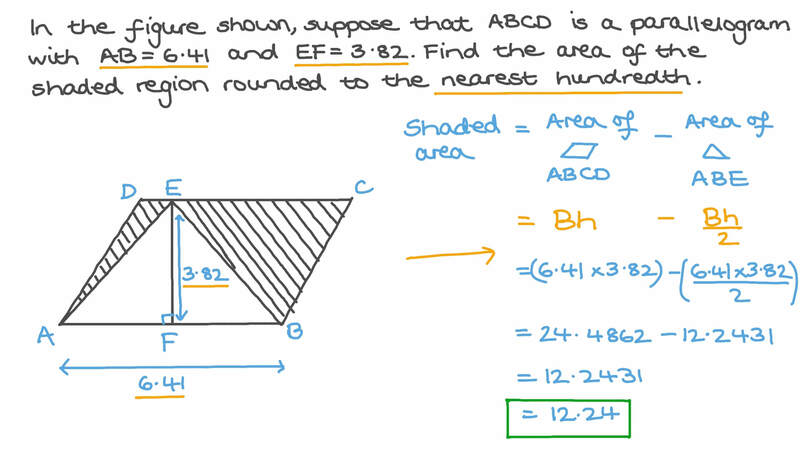 Find the area of the shaded region, giving your answer to two decimal places. In the figure, 𝐴 𝐵 𝐶 𝐷 is a rectangle, and the points 𝐶 , 𝐷 , and 𝐸 are collinear. Given that 𝐵 𝐷 is parallel to 𝐴 𝐸 , find the area of 𝐴 𝐵 𝐷 𝐸 . Calculate the area of the given figure. Find the area of the given figure. Find the area of this figure. Given that the four triangles in the shown rectangle are congruent, calculate the area of the coloured region. Find the area of this shape. Determine the area of the shown figure. The circle at 𝑂 has radius 34 cm. Chord 𝐴 𝐵 is 60 cm long, 𝐶 is the midpoint of 𝐴 𝐵 , and ray  𝑂 𝐶 meets the circle at 𝐷 . Find the area of △ 𝐴 𝐷 𝐵 .
𝐴 𝐵 𝐶 is an isosceles triangle inscribed in a circle where 𝐴 𝐵 = 𝐴 𝐶 = 3 7 cm and 𝐵 𝐶 = 3 8 c m . Find the area of the minor segment with chord 𝐵 𝐶 giving the answer to the nearest square centimetre. Triangle 𝐴 𝐵 𝐶 is right-angled at 𝐵 . Given that 𝑚 ∠ 𝐴 = 3 0 ∘ , and 𝐴 𝐵 = 6 8 . 2 . Find to the nearest hundredth the area of the circle that lies on 𝐴 and 𝐵 and is tangent to 𝐴 𝐶 at 𝐴 . Two circles intersect each other where the chord connecting the points of intersection is a diameter of one of the circles. The length of the diameter is 76 cm which is the same length of the radius of the other circle. Find the common area between the two circles giving the answer to two decimal places. The picture shows the design of a logo which is formed from two semicircles with a common center. Work out the perimeter of the logo, giving your answer in terms of 𝜋 . Work out the area of the logo, giving your answer in terms of 𝜋 .